Baby, it's cold outside. Like, really cold. It-was-0°F-when-I-got-out-of-bed-this-morning cold. It calls for a good bowl of soup, don't you think? This is one of my favorites. Thick and creamy, it's the ultimate comfort-food dinner for these frigid winter nights. And it makes it easy for kids to eat their vegetables. Happy soup season. Add 1 tablespoon unsalted butter to a large pot on medium-low heat. Once melted, add the onion, a dash of salt and pepper, and sauté until tender and slightly transparent. Scrape onion into a bowl and set aside. Melt 1/4 cup unsalted butter in the saucepan, still on medium-low heat. Add the flour and stir vigorously for 3 to 4 minutes until it forms a thick paste. 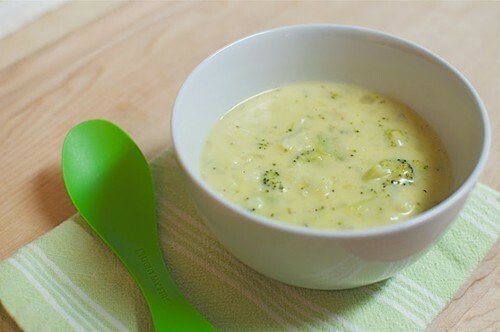 Add the milk and soup stock, increasing the heat and stirring constantly until it reaches a gentle simmer. Continue to simmer for 20 minutes. The liquids will start to visibly thicken. Add the broccoli, cauliflower and sautéed onion; stir. Continue to simmer for 20 minutes until the vegetables are tender. Add the grated cheese and stir until fully melted. Taste and season with salt and pepper if needed. Serve hot.